Comprehenive sheet; unique subjects; outstanding support material; sheet packed with markings. With Classic Airframes releasing a model of the TA-4 Skyhawk (finally! ), it was only a matter of time before the after-market decal industry picked up on this and created decals to go on the new kit. The first out of the chocks is Afterburner Decals. 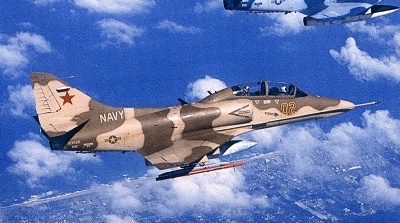 While most TA-4 Skyhawks lived their entire lives in simple white and orange training paint, a select few saw service with the US Navy Adversary units (VA-43, VA-45, VA-126, VA-127, and Topgun). 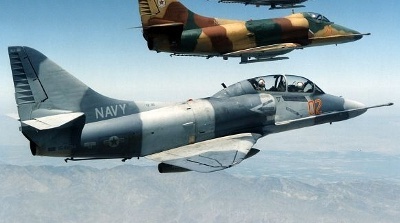 In the adversary units, these TA-4 Skyhawks got the same camouflages applied to them that all the rest of the adversary aircraft were wearing. 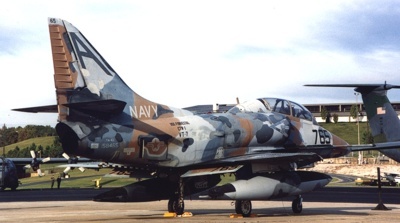 Afterburner Decals has aimed their first Skyhawk decal sheets straight at these colorfully camouflaged adversary aircraft. I had a hand in the research of this decal sheet, so it was no surprise to find that Afterburner had nailed down the colors and markings pretty well on this sheet. The package for these decals is the customary clear zip-lock baggie. The package is thick, having both the decals and two folded 8.5 x 11 inch full color instruction sheets. The register of the decals in my review samples was perfect. The instructions provides four-view diagrams of each aircraft, so you have everything you need to paint the models. To save some bandwidth in this posting, you may click this link to go to the Afterburner web page displaying the camouflage diagrams. You can even order the sheet right from there! The majority of the decals are literally crammed onto a single sheet. You will need to take care cutting these off the page or else you might damage others of the decals. There is a small addendum sheet with a few missed markings for inside the wing flaps. The decals, themselves, are printed by Cartograf, which speak volumes to their usability and quality. When I spoke to Scott at Afterburner, he told me Cartograf allowed them to reference the colors of the decals in F.S. numbers (instead of Pantone number), so there is little excuse for the printing to be in the wrong colors. As I found out recently using some TwoBobs decals, being the right color on the decal paper does not guarantee the markings will be the right color on the model, but having the colors correct on the paper is at least a good start. I pulled out my Federal Standard color chips fan deck and spot checked all the colors on the sheet. The good news is that they are pretty much spot-on for all the colors they are intended to represent. I'll find out later if they retain their colors when applied to a model. #1: TA-4J 153488, VT-7, 1991. This aircraft started as a green/brown/tan camouflage, then had lots of touch-ups made in a second green and black. The effect creates a very busy camouflage. I saw this bird a bit earlier in its career before all the touch-ups started being added. #2: TA-4J 158465, VT-7, 1992. This aircraft, like the one above, started with a simple camouflage of tan with two grays. In time it gained lots of touch-ups in two other grays. The decals are from the 1992 time frame. I saw this bird in person in 1993 when it had even more touch-ups on the airframe. #3: TA-4J 153525, VC-8, 2002. 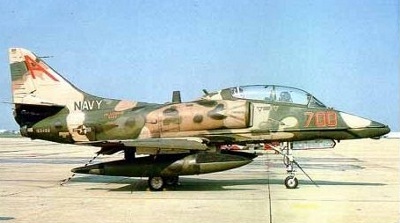 This aircraft is one of the last Skyhawks flown in US military service. This is the scheme worn by the jet when retired. Note, the instructions mention red inside the wing flaps, but neglect to mention that there also was red inside the wing slats. 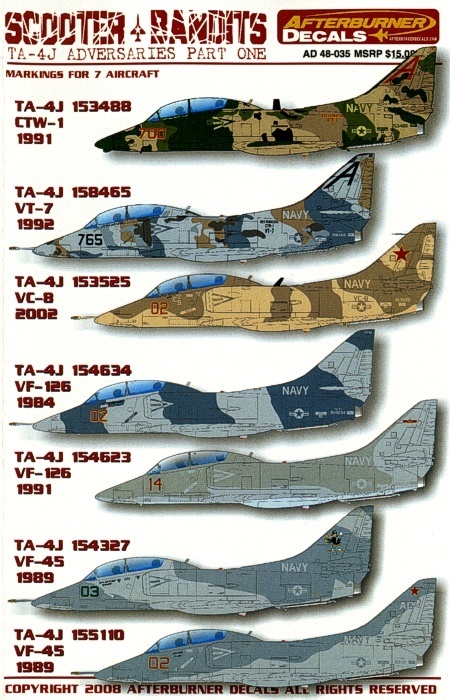 #4: TA-4J 154634, VA-126, 1984. This aircraft was the personal mount for "Duke" Cunningham when he flew with VF-126. As the image to the right shows, this aircraft appeared to have light colored wing walkways. The decal instructions missed this. 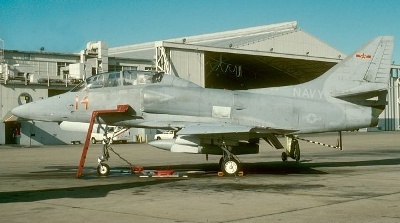 TA-4J 154623, VA-126, 1991. This aircraft appears to have come straight from a Marine unit and is still wearing the standard low-vis TPS paint scheme. #6: TA-4J 154327, VA-45, 1989. I could not find any images of this aircraft. #7: TA-4J 155110, VA-45, 1989. I could not find any images of this aircraft. All this is great. I could find no real faults with the decals. There are some challenges when you go to use them, however. As I mentioned above, the sheet is crammed tight with markings. Modelers will need to take care cutting out the decals so as not to damage any surrounding decals in the process. The other issue that could cause some trouble is that the colors of the decals are quite subtle, especially on the gray aircraft. Most of the gray aircraft have two or three color tones of markings and they can be easily mixed up. Modelers will need to watch which decals they apply where to get the correct ones in the correct locations based on the colors. There is no numbering of the decals to assist the modelers to know exactly which decals go where. But, this is a pretty picky point. With care, the average modeler should be able to figure things out. 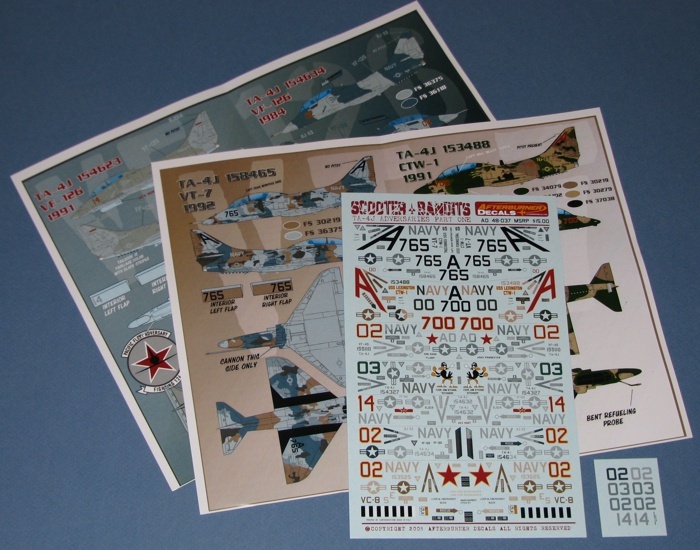 This is a great decal sheet with lots of colorful camouflage options to use on the new Classic Airframes TA-4 Skyhawk kits.